Series 2 of 'Suits' is back on Dave and if you haven't been watching, you've been missing out. Starring Gabriel Macht and Patrick J. Adams as Harvey Specter and Mike Ross, a duo that goes together like Scooby Doo and Shaggy. This series drama is based in a lawyer firm called Pearson Hardman, one of the top lawyer firms where everyone wants to work. However, we get to see the cracks with the pressures of facing other lawyer firms and each other. Harvey Specter is the man every guy wants to be (including myself!) and every girl wants to be with. He is Pearson Hardman's top closer and has an ego to rival North Korea. Thankfully his boss Jessica Pearson (Gina Torres) is there to bring him back down to size. And then there is Mike Ross, Harvey’s associate attorney and loyal partner in solving cases. Mike is the college dropout who lands a job with Harvey after a drug deal goes wrong. The catch is that the firm only hires Harvard graduates so each day Mike is tricking the company into believing he is a Harvard graduate, a secret only Harvey and Donna Paulsen (Harvey’s personal assistant played by Sarah Rafferty) know. 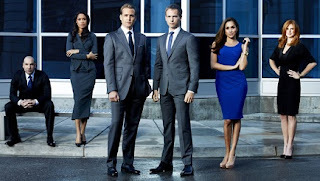 'Suits' also have a great comedy factor to it, which is mostly brought by Louis Litt (Rick Hoffman). Louis is a Senior Partner in the firm and feared by the junior associates. His witty insults and creative facial expression really do bring out the stereotypical ‘worker from hell’, which will make you either loathe him or love him! Unlike other law based shows such as 'Ally McBeal', 'The Good Wife' and 'Franklin & Bash', 'Suits' brings out the glamorous side to law. With all these good-looking people on this show anyone would think you are watching 'Hollyoaks' but with a lot better acting. Dave has done well by commissioning 'Suits' in the UK and with a third series on the way, this is one show I would recommend jumping on the bandwagon too. Catch 'Suits' on Dave every Thursday at 9pm. Irish fish chowder, herbed venison cutlets, and pappardelle and meatballs are just some of the fancy dishes being cooked up in series 9 of 'MasterChef'. John Torode and Gregg Wallace are back to put some amateur cooks through their paces. Even with Wallace’s recent weight loss, it looks like he will be packing on back the pounds as he and John tuck into some truly to die for dishes. In each episode, the contestants are challenged in different areas: The Invention Test, The Palate Test, The Professional Round and The Final Round. As we go through each stage, amateur cooks are knocked out of the competition until there is only one, the 'MasterChef' Champion! We're already well into the competition but so far these contestants seem to be getting it easy. In previous series especially in the The Professional Round, there seems to be a lot more pressure on the amateurs but this year it seems like they are being a bit softer and wrapping these amateur cooks in cotton wool. And after a while watching John and Gregg give us a dental exam while they stuff their faces can be quite off putting, I don't even like looking into my own mouth let alone others! Even after nine series, 'MasterChef' still reigns as one of the best cooking shows around. As much as I hate the way John and Gregg attack the food as if it is their last meal, they are a dynamic duo and bring that added drama and tension needed for such a heated show. 'MasterChef' is a show that will go on for some years as long as the formula and John and Gregg are still involved, with the right ingredients. Catch 'MasterChef' on BBC One or on BBC iPlayer.